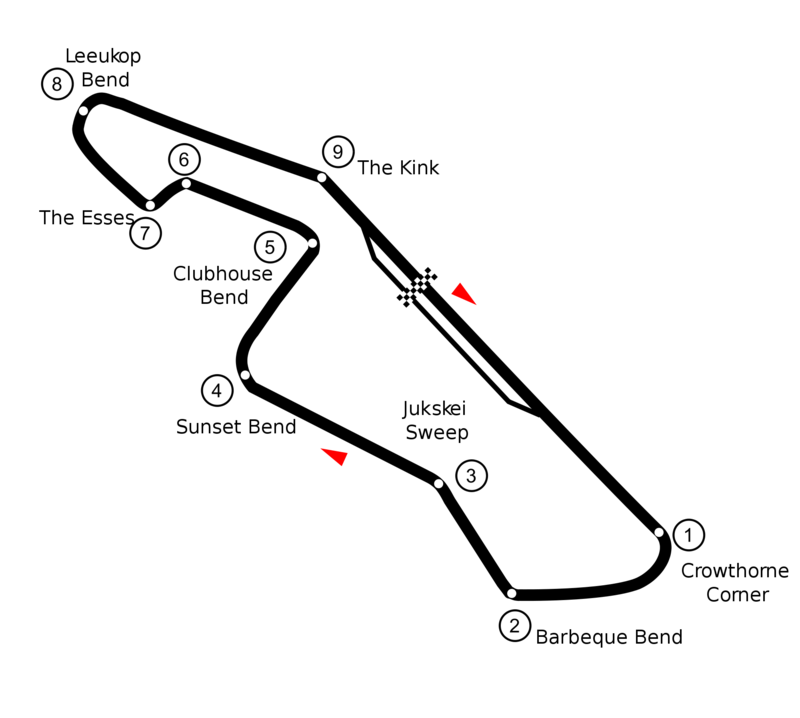 Kyalami layout (1982). © Creative Commons. Without the public displays of placated aggravation and sugar-coated cat calling, Formula 1 would probably fall from the public eye. Formula 1 loves controversy; it feeds off of it. This is not to forget the often-epic drama that is Grand Prix motor racing of course, but that is merely an expensive sideshow to infinitely more expensive politicking. Constant deployment of news, irrespective of its trivial nature, keep the pub experts (that’s you and I) chattering feverishly for hours and days on end. For the most part, the controversy generated within the walls of Formula 1 is generally harmless techno-babble nonsense, incomprehensible to the most eloquent accountants and middle-management types. Whereas modern Formula 1 likes to gets down and dirty amidst the details of highly stringent regulations (Bahrain debacle aside), the sport does its best to avoid highly political battles, for these cast Formula 1 in a dispiriting light. At the start of 1982, Formula 1 got it very, very wrong. As they struggled for control of the sport in the late-1970’s, both FISA (then the governing body for motorsport) and FOCA (the Formula One Constructors’ Association) maintained a tense battleground. The organisations – led by Jean-Marie Balestre (FISA) and Bernie Ecclestone (FOCA) – would spend several years fighting a bitter feud over Formula 1’s governance, licences and lucrative commercial matters. It would see two Grand Prix having their world championship status revoked (1980, Spain; 1981, South Africa), following the withdrawal of factory teams, Ferrari, Renault and Alfa Romeo. Prior to the opening Grand Prix of the 1982 season, FISA introduced new harsh new clauses into driver super licence contracts – clauses noted by an astute Niki Lauda. The critical terms included an agreement forcing drivers to stay with any given team for a minimum of three years, potentially giving FISA a grip on the driver transfer market. Competitors would also have to make their earnings public, while never publicly criticising the governing body. Incensed by these clauses, the Grand Prix Drivers’ Association (led by Didier Pironi and Lauda) decided to strike prior to the opening practice session in Kyalami, much to the chagrin of the promoter. Escaping from the circuit in a bulbous orange bus – despite the promoter’s best efforts – the drivers headed for a hotel in Johannesburg, where they remained holed up overnight. Support for the strike wasn’t completely unanimous amongst the drivers, especially with a number of the younger competitors. Faced with the possibility of their racing careers stalling before they had even hit top gear, Keke Rosberg and Manfred Winkelhock fiercely objected to the action. Meanwhile, Toleman’s Teo Fabi broke ranks, joining his team on Friday morning, while March racer Jochen Mass was unaware of the protest, having chosen accommodation away from the rest of the Formula 1 contingent. Often known for his apolitical nature, Mass showed up at the circuit the following morning, completely oblivious to the fuss. In the Brabham camp, Ecclestone sacked reigning world champion, Nelson Piquet, and his teammate Riccardo Patrese, although he would rehire them prior to qualifying. Eventually, the GPDA came to temporary agreement with FISA, delaying the battle for a just short period. When practice did start, Rene Arnoux took pole ahead of Piquet*, Gilles Villeneuve and Patrese. *Interestingly, Ecclestone and Piquet had a minor (and short-lived) falling out due to the strike; ensuring that when the Brazilian returned to the paddock, the spare car was numbered and set-up solely for Patrese. Piquet’s first timed lap of the weekend was the one that gave him his front row position in qualifying. Lauda – his comeback now a second-tier story – suffered an off in qualifying; he would assume 13th on the grid, despite a bent suspension arm. Arrows substitute Patrick Tambay decided to retire rather than take his contracted drive with the team, gifting ex-Formula 2 champion, Brian Henton, a late drive. Tambay, who was replacing the badly injured Marc Surer, had developed an intense distaste for the sports politics, while also remaining unsure of the features within the Arrows A3. Ensign’s Roberto Guerrero was withdrawn from the event prior to qualifying, when his ex-Formula 2 team manager, Willi Maurer, took exception to his charge racing in Formula 1, claiming the Colombian had another year to go on his F2 contract. Amidst his earlier noise and bellowing, Fabi failed to qualify, despite the field cap being raised to twenty-six cars. **The sport wasn’t the only embarrassed element. The night before the Grand Prix, Lauda made an appearance on South African television apologising to fans for the disruption, while Pironi addressed the raceday crowd over the Kyalami PA with a similarly contrite message. Some time after the chequered flag dropped, the top six drivers offered their helmets as raffle prizes for the somewhat discontent audience. Later in Paris, drivers were fined and some paid up. As a result, the GPDA was forcefully disbanded following the Kyalami debacle, laying dormant until a few days prior to the 1994 Monaco Grand Prix. In place of the GPDA, the Professional Racing Drivers Association (PRDA***) was created, although that was somewhat less grandiose in stature and less successful as a result. ***The PRDA was also a United Stated based union called the “Polish Racing Drivers Association” (now known as “Polish Racing Drivers of America”); however one did not have to be either Polish or a professional racing driver to qualify. If I recall correctly, Paul Newman was a notable member. In the race itself, Alain Prost won with a stunning comeback drive following a mid-race puncture. After starting 5th, the Frenchman jumped to 2nd off the line, eventually taking the lead from teammate Rene Arnoux thirteen laps in. Prost controlled the race for a further thirty tours, before his Michelin tyre shredded in the Kyalami heat, gifting the lead back to Arnoux. Limping back to the pits for a lengthy stop, dropping to the edge of the top ten and losing a lap in the process. With fresh rubber, Prost surged back up the order, unlapping himself and reaching the top six by the fifty-third tour. Within two laps, the Renault pilot had made short work of John Watson (McLaren) and Keke Rosberg (Williams) to grab 4th. By lap sixty-three, Prost had also forced a way passed Ferrari’s Didier Pironi and Carlos Reutemann in his Ford-powered Williams for 2nd, leaving only Arnoux in Prost’s way. It would not be long before the lead changed hands once again. Struggling for tyre grip, Arnoux lost all semblance of pace in the second half of the race. Despite holding a lead of approximately forty seconds at the mid-point, Arnoux’s lead shrunk dramatically as first Reutemann removed chunks from the gap, with the searing Prost soon finishing the job. On lap sixty-nine, Prost cruised by Arnoux with ease to take a memorable win and nine points. Arnoux’s pace continued to fall away once Prost had passed. Displaying encouraging pace in the rarefied air, Reutemann continued to catch the ailing Renault at two seconds per lap; finally drawing to the rear of Arnoux with four tours remaining. The Argentine pilot made short work of the Frenchman, grabbing the runner-up sport as they headed into the first turn for the seventy-fourth time, ensuring that Williams’ normally aspirated Ford engine would split the turbo-powered Renault’s on the podium. Niki Lauda also put on an impressive display in his comeback drive with the McLaren Ford team. Despite his two-year absence, the Austrian showed he had lost little of his race craft, with a fighting drive from 13th on the grid to 4th in the race. Lauda had spent much of the event following Rosberg and teammate Watson, passing both on laps sixty-seven and sixty-eight respectively. Following a near race long battle, Rosberg’s and Watson’s tyres fell away, along with their pace, solidifying their 5th and 6th places. Neither were threatened by Michele Alboreto (Tyrrell) or Elio de Angelis (Lotus) – both of whom just missed the points in 7th and 8th; while Eliseo Salazar led his ATS-Ford teammate Manfred Winkelhock home to the flag in 9th. There was disappointment for some of the perceived front-runners. Neither Brabham finished as Nelson Piquet spun off (lap 3) and Ricardo Patrese suffered a turbo failure (lap 18). Both Ferrari’s also suffered mechanical failure’s, ensuring neither finished. Former ABBA drummer Slim Borgudd made himself known thanks to a mid-race spin. The Swede spent a brief period executing a three-point turn on the far side of the circuit, after a short rolling the wrong way down the road. Alas, the 1982 South African happened by the skin of its teeth and in doing so, became the final Formula 1 World Championship race to held in January; however the follow-up event in Argentina, scheduled for March 7th, was rather less fortunate.